I love casual flower arrangements. I don't feel comfortable fussing with things too much. In fact, the more I fuss the worse things usually look anyway because then my original vision gets lost. I've learned to just go with my first instinct and to be happy with what comes the most natural to me. I tend to like flowers in a variety of containers and I enjoying mixing blooms so that there is plenty of texture and color, even if I'm using mostly pink flowers I find that the many tones give such depth and personality to an arrangement. I also like white carnations and find that they get such a bad rap for no reason, a carnation is a feminine flower with lovely ruffled layers. I think the carnation is a tricky bloom though, it doesn't play well with others and looks best when it's paired with other carnations and in my opinion, looks best with others the exact color -- a carnation can suddenly look so sophisticated bunched together. In addition to flowers, I also love flowering branches in my home and recently I've been getting more and more into plants like olive and rosemary topiary trees and succulents. 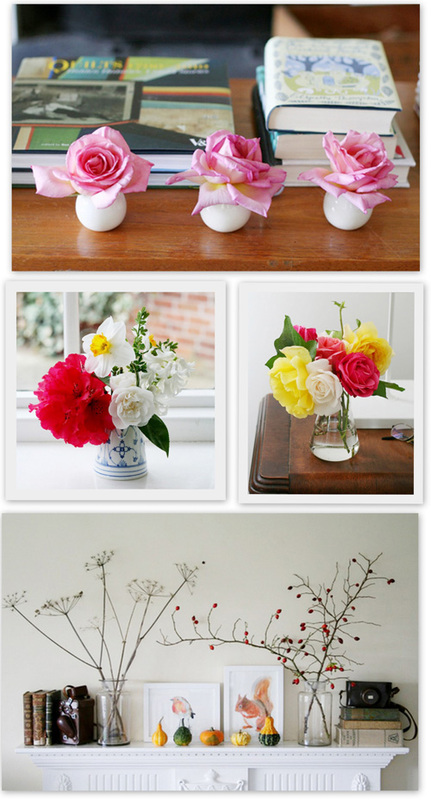 What about you, do you like simple flower arrangements or do you tend to spend a lot of time putting yours together? One lady in blogland, Constança Cabral, does such a nice job arranging casual bunches and displaying them in her home. She just may inspire you -- her many lovely photos are shown above. She is from Lisbon but currently living in England where she has an apartment in the countryside with a small garden where she picks most of her lovely stems. Constança makes things by hand and sells them in her etsy shop and she also blogs quite frequently so if you like flowers you will love her blog.